Shopping for TRON Film Cells? Sam Flynn, rebellious 26-year-old son of Kevin Flynn, travels into the mind-blowing TRON universe. On his heroic journey to find his missing father, he must defeat the evil overlord, Clu - learning along the way to accept the responsibility of his remarkable legacy. The film strip portrayed in the image above is only an example of the film cells you may receive. Please note, the cells may vary from piece to piece because they are hand selected from reels of film. This item contains clips of the film and portrays memorable images and scenes all on a stunning descriptive plaque. These elements have been double mounted and placed within a beautiful black wood frame measuring 20-inches wide x 11-inches tall. 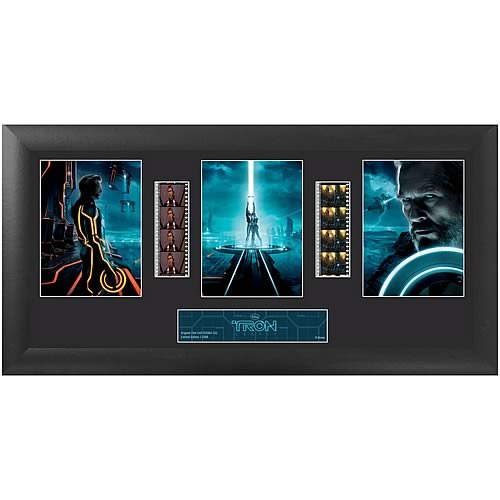 The TRON Legacy Series 3 Trio Film Cell comes with a certificate of authenticity and is a limited edition of only 2,500 pieces!